Discovering potential faults with your printing press before they turn into damage or failures is worth the extra effort and care. For the sake of simplicity the maintenance tasks described below are generalized and are not specific to make or model. Adapt suggestions as indicated; specialized maintenance tasks as required by your particular equipment should be researched and duly executed. A preventative maintenance schedule is simply a timed series of procedures and inspections of your shop equipment independent and in addition to the normal maintenance performed during use cycles. The most effective way to make the tools, equipment and presses in your shop perform at their best is to establish a regular and consistent system of maintenance and inspection. The tools needed are a notebook, calendar and pencil. You may use your home computer, PDA, or smart phone if you so choose. Once you have made your list use the following frequency guidelines to mark calendar dates for each piece of equipment’s scheduled maintenance cycle. The frequency repeats for the life of the equipment, so if you start a maintenance cycle of every week for example, you would simply mark the cycle for every seventh calendar day. It’s recommended to stagger as much as possible to avoid over tasking yourself and invite the temptation to cut corners or rush. These are general suggestions for cycle frequency, they should be adapted and referenced for specific equipment in your shop. All printing equipment regardless of complexity benefits from regular attention. Inspect and mitigate collected dust or debris in type cases. The best maintenance tool is an accurate record of what’s been done, repaired, and how much work has been printed on your equipment. Memory is fallible over time. Pen and ink is generally more reliable. 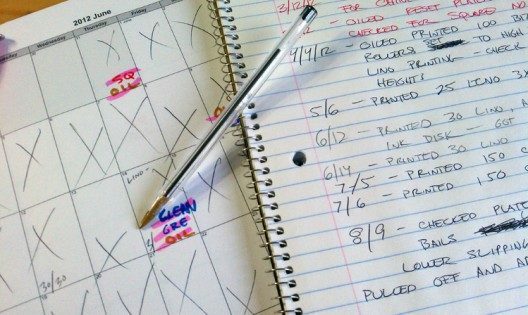 Keeping log books for each of your printing presses and one for your shop in general is a great record of what you have accomplished and a useful troubleshooting tool. Make entries in the Press Logs on the date, number of impressions and any operational issues encountered for each job you print. This is an excellent tool for spotting any creeping symptoms of larger issues, judging wear for part replacements and the efficacy of your maintenance frequency. Make entries in your Shop Journal of the dates and progress of projects and significant tasks done around the shop. Number your projects and keep notes as you progress through execution. You can be as elaborate as including ink and paper swatches into entries or as simple as short written entries. This is an extremely valuable auto-didactic tool which enables you to repeat results and explain issues to repair techs or mentors. You can review as needed at your leisure to refresh your memory and build on previous techniques. Estimate your expected material use over a three month period and supply accordingly. Performed a scheduled inventory check every three months. Make a note of materials that are below estimated levels for five additional uses. Post your inventory replenishment notes prominently where you will see them every time you enter or leave your shop area. This gives you five chances to remember to re-supply before you run out. Profit from being prepared: time and expense lost to unplanned supply runs or rush shipping costs is never fully recovered.